Good Job Reward Chart - Grow Children's Boutique Ltd.
A job well done deserves a reward! Help kids develop, track, and earn rewards for their responsibilities and good behaviors with the Good Job Reward Chart from Learning Resources. 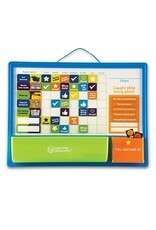 This customizable magnetic responsibility chart features magnetic tiles and stickers corresponding to common household tasks, from “Make the Bed” and “Help with Dinner” to “Do Homework” and “Brush Your Teeth.” After picking out the tasks of their choice (or customizing their own with the set’s blank stickers), kids and parents can track daily progress with the set’s positive accomplishment magnets. 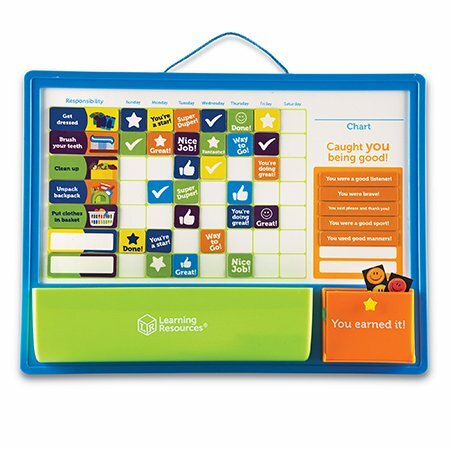 Parents can add incentive and reward positive progress with small toys or treats kept within the chart’s fun reward box. Kids can also earn their rewards through good behavior that’s unrelated to chores. The Good Job Reward Chart’s “Caught You Being Good!” section gives parents space to recognize and celebrate little moments of sweetness with magnets and stickers complete with affirmation-filled phrases.